An extra-fine, organic filet bean intended to be picked while pods are very slender. Tavera has plants that are resistant to bean anthracnose and bean mosaic virus. What do we mean by "Halo Blight-Free" seed? Halo blight is a seed-borne bacterial disease that can be a major problem for bean growers. It also can survive on bean plant "trash" or debris. We source our bush beans from Western states, where the disease is not known to occur. What purpose do inoculants serve? Why is bean seed color important? Dark seeds germinate better in cool soils than white seeds. Are some beans more heat tolerant than others? Why? Yes. Heat tolerance in beans means that they set pods better in hot weather. This is a genetically-controlled trait for which beans can be selected. Why the adage to "Pick your beans in the afternoon"? 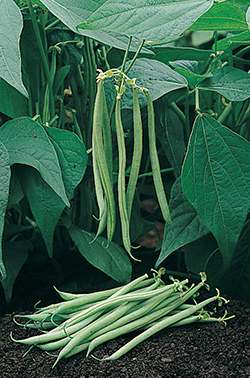 Picking after the plants' leaves dry minimizes the spread and impact of disease on wet beans. Like most plant pathogens, bacterial blight (Xanthamonas phaseoli), halo blight (Pseudomonas phaseolicola), and bacterial brown spot (Pseudomonas syringae pv. syringae) can be more easily spread at any time the plants are wet, as they typically are with the morning dew. Do purple beans stay purple when cooked? 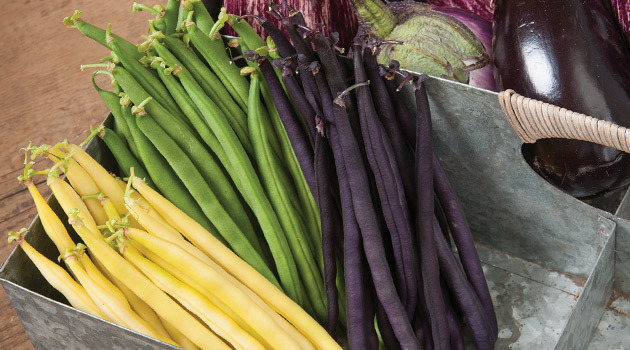 With cooking, purple beans will generally turn green (although a hint of burgundy may remain for some colored beans, depending upon the cooking method used).